I’m doing it again. 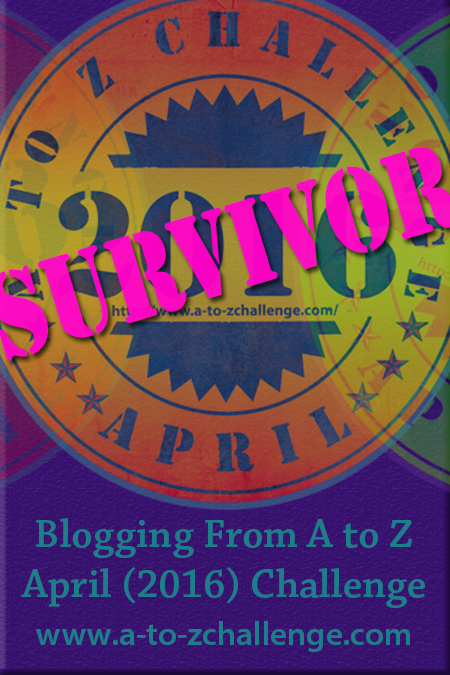 I’ve joined up with the April A to Z Blog Challenge for my 6th consecutive year. And for the 3rd year in a row, you’ll get to watch a quilt unfold. I’ve been inspired this time by a drive-by of the Kansas City Star building in Kansas City, Missouri. Many of you may not know that this newspaper was world reknowned for it’s weekly quilt block publication beginning in the late 1920’s. I’m not giving up too much more about that until Challenge time, but just know, I’ll strictly be using blocks previously published in the KC Star. If you’re a fellow blogger, welcome to this madness we call a Challenge. If you’re just dropping in, maybe you’ll check back on April 1 (no foolin’) and see what all the fuss is all about. You can click here for other theme reveals, a list of the participants, or to join up. You have until March 28 for the theme reveal posts, and sign up closes April 6. But you can read all the instructions by clicking here. Thanks to our hosts again this year and know you are greatly appreciated. Thanks to my readers. And especially thank you to my family who endure and support my fabric creations. The April A to Z Blog Challenge is an annual blogging event in which participants blog every day (except Sundays) one post for each letter of the alphabet for the entire month. My theme for the year will be “Quilts and Ozark Slang.” So gitchur coffee or sodapop, grab a pilluh, and sit a spell. So the Ozark slang for the day is probably not that unknown, but it was well used back in the day during my high school years. Miss Goody two shoes is the phrase and you know the type. They’re all about themselves and think they are too good to even breath the same air as you. Hence they were portrayed by my friends with a finger towards a turned up nose. It’s most definitely a mudslinging term if they came from the same station in life as you and were no better off. We would say they were ‘above their raisin’. The Letter today is E.
The layout that needs ironing. Something I haven’t Explained yet is the reason to lay out the pieces as you see above. One reason, for me at least, is to make sure all the right sides are facing up. Sometimes the difference between the front and back of a fabric is pretty similar…..until you sew it together wrong. Then it sticks out like a sore thumb. And of course you’d be obligated to rip it out and sew it over. Just a pain when you are on a timeline like this A to Z Challenge. Carpenters measure twice, cut once. Quilters check the fabric by it’s right or wrong side as well as if it’s in the correct direction. We’ll leave the ‘direction’ of the fabric topic for another post, though. So, it appears we have another star-ish block for letter D. It’s titled Doris’ Delight as the picture tells. A pretty simple block to sew together, and you’ll notice how the triangles are not pointed before sewing. This is very helpful in getting that perfect point in the finished look. It would be a good beginner to intermediate block if you’ve wanted to try a star block that’s just a little different. I do wish the book had a story behind each block name. If it were up to me, I’d be inclined to tell of my Great Aunt Doris from Virginia. We became penpals after a visit early in my marriage. She was my husband’s aunt and we were instant friends. She was a true lady in my opinion. A very tiny, but mighty Christian woman who was always quick with a Bible verse to lean on. And talk about a teddy bear collector! Sadly she passed on quite a few years ago and I would like to think they’ve named a star after her. And thanks to my husband who blessed me with Aunt Doris, I was also blessed with a new word from his Ozark roots. Discombobulated. He used this word with a little glint in his eye the first time I heard it. It took me aback I’ll admit. I’m pretty sure he intended to use it to impress me. (Along with his impressions……but now I’m getting distracted.) Now I’ve heard some unusual words, but I chose this one just because of him. It’s meaning: “Totally messed up beyond repair or recognition.” I can only imagine the looks of his new Marine Corp acquaintances in Cali when he blurted this one out. The Layout of my fabric pieces helps me keep organized. I’ve got to admit, there are a lot of ‘star’ quilt blocks out there. And I’m not very sure why this one is called simply “Combination Star” except for possibly the combination of diagonal squares in each corner to give it a different appearance. I will have to do a tally of just how many star blocks are in my selection for the A to Z Challenge. Til then, I’ll just ask, Do you see the star in this block? For the Daily Ozark slang, I present “Chester Drawers”. This is the place you’ll find a stash of my quilts. In other words, a “Dresser”. Or where you store your socks, pajamas, tshirts, etc. My mother was good about proper grammer due, I believe, to the fact that her mother was a one-room schoolhouse teacher. Grammer was her thing. So around my home, this word wasn’t used so much. Maybe it slipped out now and then? I don’t remember if it ever did. But we all recognized its use when used by others. It’s that time of year again. I’m about to blog every day in the month of April (except Sundays) for the Blogging from A to Z Challenge. Welcome to you if this is your first time participating. Welcome if this is your first time reading. For myself, it’s Year #5. Where has the time gone?? This year has been somewhat of a panic for me though I have to admit. I wasn’t as prepared and I am a bit embarrased. It’s not like April doesn’t come around every single year. But once I decided to add my name to “The List”, I bit the bullet and plunged in up to my neck. I’m not drowning so that’s the main thing, right?! To guide me along this year, I’m using what I know for my theme. If you are a follower of this blog already, you’ve probably guessed it. And you would be correct if you guessed a hand made theme. So this is the second year I will blog each day with a quilt block. As a bonus I’m going to reveal at the very end the finished quilt top from last year’s challenge. So hope you’ll check back each day to see the finished block for each letter of the alphabet. Don’t forget to head over to the official site for the other Theme Revealers as well as entrants of this years Blogging from A to Z Challenge. There are so many wonderful entrants and a topic to interest everyone! During the month of April, I’m participating in the Blogging From A to Z Challenge for my 4th year in a row – 3 of which are on this blog. Each day, except Sundays, there will be a post for the letter of the day as well as keeping with my personal theme of Quilts and Quotes. Feel free to leave a comment! I’d love to hear from you! Also check out the other A to Z’ers in the comment section of the Official A to Z Blog Page. Grandmother’s Favorite is the name of this block and is a sentimental choice. I had such loving grandmothers. I’m sure many people have those feelings when it comes to theirs as well. So a place in this quilt to honor grandmothers is absolutely mandatory. 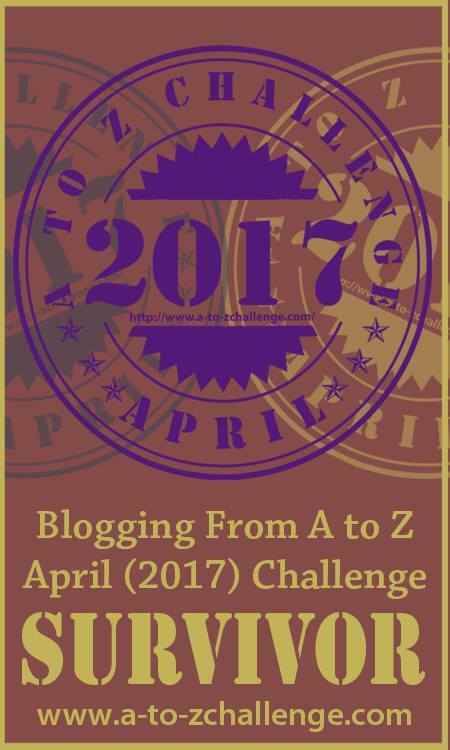 Join me again tomorrow for more of the April A to Z Blog Challenge 2017! Just a short post today.I’m diving in once again with my fellow A to Z Patriots. Beginning Saturday, April 1st (no foolin’ here), I’ll have a post a day (except Sundays) for the entire month of April. I am going with another “Handmade” blog theme. This year I’m calling it, “Quilts and Quotes”. I’m creating a quilt block for each letter of the alphabet and adding a positive quote, saying or tidbit for each day as well. Sorry, no pics until the Challenge has begun. I hope you’ll check back each day to see how the quilt-making evolves. Til the ‘day of submergence’, I will keep up with my normal style, including Thursday Doors with the well-respected Norm 2.o and friends. I had a little motivation to start a baby blanket around the beginning of the month. It started as a color test, to see how I liked the wave pattern and the color choices. Nearly 20 days later, we have one more round of colors to add and this one is ready for a special baby. Weaving in those ends this evening. Do you have something handmade to blog about? I hope you’ll share it and link up! To make it easy for others to check out your post, title your blog post “Sunday Sampler” and add the same as a tag. Remember to Follow to be able to check on others who participate as well by clicking on the links in the comment box. Your hand made item on the challenge can take any form: but it has to be about the topic!